A horn section is a group of musicians playing horns. In an orchestra or concert band, it refers to the musicians who play the "French" horn, and in a British-style brass band it is the tenor horn players. In many popular music genres the term is applied loosely to any group of woodwind or brass instruments, or a combination of woodwinds and brass. A horn is any of a family of musical instruments made of a tube, usually made of metal and often curved in various ways, with one narrow end into which the musician blows, and a wide end from which sound emerges. In horns, unlike some other brass instruments such as the trumpet, the bore gradually increases in width through most of its length—that is to say, it is conical rather than cylindrical. In jazz and popular-music contexts, the word may be used loosely to refer to any wind instrument, and a section of brass or woodwind instruments, or a mixture of the two, is called a horn section in these contexts. An orchestra is a large instrumental ensemble typical of classical music, which combines instruments from different families, including bowed string instruments such as the violin, viola, cello, and double bass, brass instruments such as the horn, trumpet, trombone and tuba, woodwinds such as the flute, oboe, clarinet and bassoon, and percussion instruments such as the timpani, bass drum, triangle, snare drum and cymbals, each grouped in sections. Other instruments such as the piano and celesta may sometimes appear in a fifth keyboard section or may stand alone, as may the concert harp and, for performances of some modern compositions, electronic instruments. The French horn is a brass instrument made of tubing wrapped into a coil with a flared bell. The double horn in F/B♭ is the horn most often used by players in professional orchestras and bands. A musician who plays a French horn is known as a horn player or hornist. The German horn is a brass instrument made of tubing wrapped into a coil with a flared bell, and in bands and orchestras is the most widely used of three types of horn, the other two being the French horn and the Vienna horn. Its use among professional players has become so universal that it is only in France and Vienna that any other kind of horn is used today. A musician who plays the German horn is called a horn player. The word "German" is used only to distinguish this instrument from the now-rare French and Viennese instruments. Although the expression "French horn" is still used colloquially in English for any orchestral horn, since the 1930s professional musicians and scholars have generally avoided this term in favour of just "horn". Vienna horns today are played only in Vienna, and are made only by Austrian firms. German horns, by contrast, are not all made by German manufacturers, nor are all French-style instruments made in France. The Vienna horn is a type of musical horn used primarily in Vienna, Austria, for playing orchestral or classical music. It is used throughout Vienna, including the Vienna Philharmonic and Wiener Staatsoper. Horn sections are an integral part of musical genres such as jazz, R&B, blues, soul, funk, calypso, ska, and gospel. Most of these horn sections feature some combination of saxophones, trumpets and trombones. More rarely, other wind or brass instruments such as flute, clarinet or tuba may be added. Other popular musical genres, such as rock, pop, hip-hop, latin, and country music also use horn sections. [ citation needed ] When only woodwinds are involved, the term "reed section" is often used, even when flutes are included ( Anon. 2002 ). Rhythm and blues, commonly abbreviated as R&B, is a genre of popular music that originated in African American communities in the 1940s. 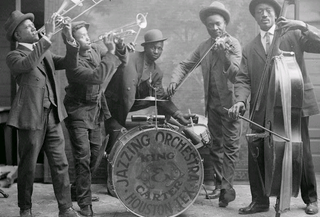 The term was originally used by record companies to describe recordings marketed predominantly to urban African Americans, at a time when "urbane, rocking, jazz based music with a heavy, insistent beat" was becoming more popular. In the commercial rhythm and blues music typical of the 1950s through the 1970s, the bands usually consisted of piano, one or two guitars, bass, drums, one or more saxophones, and sometimes background vocalists. R&B lyrical themes often encapsulate the African-American experience of pain and the quest for freedom and joy, as well as triumphs and failures in terms of relationships, economics, and aspirations. Blues is a music genre and musical form which was originated in the Deep South of the United States around the 1870s by African Americans from roots in African musical traditions, African-American work songs, spirituals, and the folk music of white Americans of European heritage. Blues incorporated spirituals, work songs, field hollers, shouts, chants, and rhymed simple narrative ballads. The blues form, ubiquitous in jazz, rhythm and blues and rock and roll, is characterized by the call-and-response pattern, the blues scale and specific chord progressions, of which the twelve-bar blues is the most common. Blue notes, usually thirds, fifths or sevenths flattened in pitch, are also an essential part of the sound. Blues shuffles or walking bass reinforce the trance-like rhythm and form a repetitive effect known as the groove. Horn sections in blues bands and funk groups may be composed of session musicians playing arranged parts, or they may be a consistent group of musicians. A small number of horn sections use a consistent group of musicians who become well known as a unit. Funk is a music genre that originated in African-American communities in the mid-1960s when African-American musicians created a rhythmic, danceable new form of music through a mixture of soul music, jazz, and rhythm and blues (R&B). Funk de-emphasizes melody and chord progressions and focuses on a strong rhythmic groove of a bass line played by an electric bassist and a drum part played by a drummer, often at slower tempos than other popular music. Like much of African-inspired music, funk typically consists of a complex groove with rhythm instruments playing interlocking grooves that created a "hypnotic" and "danceable feel".. Funk uses the same richly colored extended chords found in bebop jazz, such as minor chords with added sevenths and elevenths, or dominant seventh chords with altered ninths and thirteenths. Session musicians, studio musicians, or backing musicians are musicians hired to perform in recording sessions or live performances. Session musicians are usually not permanent members of a musical ensemble or band. They work behind the scenes and rarely achieve individual fame in their own right as soloists or bandleaders. 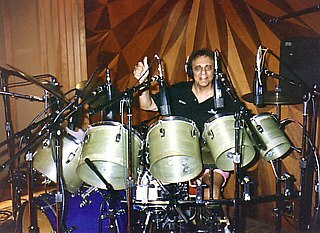 However, top session musicians are well known within the music industry, and some have become publicly recognized, such as the Wrecking Crew and Motown's The Funk Brothers. The horn section for funk band Earth, Wind and Fire. 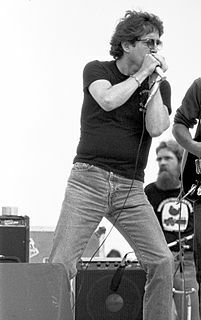 Paul Vaughn Butterfield was an American blues harmonica player and singer. After early training as a classical flautist, he developed an interest in blues harmonica. He explored the blues scene in his native Chicago, where he met Muddy Waters and other blues greats, who provided encouragement and opportunities for him to join in jam sessions. He soon began performing with fellow blues enthusiasts Nick Gravenites and Elvin Bishop. Chicago is an American rock band formed in 1967 in Chicago, Illinois, calling themselves the Chicago Transit Authority in 1968 before shortening the name in 1969. The self-described “rock and roll band with horns” began writing politically charged rock music, and later moved to a softer sound, generating several hit ballads. The group had a steady stream of hits throughout the 1970s and 1980s. In September 2008, Billboard ranked Chicago at number thirteen in a list of the top 100 artists of all time for Hot 100 singles chart success, and ranked them at number fifteen on the same list produced in October 2015. Billboard also ranked Chicago ninth on the list of the hundred greatest artists of all time in terms of Billboard 200 album chart success in October 2015. Chicago is one of the longest-running and most successful rock groups, and one of the world's best-selling groups of all time, having sold more than 100 million records. In 1971, Chicago was the first rock act to sell out Carnegie Hall for a week. Fat Freddy's Drop is a New Zealand seven-piece band from Wellington, whose musical style has been characterised as any combination of dub, reggae, soul, jazz, rhythm and blues, and techno. Originally a jam band formed in the late 1990s by musicians from other bands in Wellington, Fat Freddy's Drop gradually became its members' sole focus. Band members continued playing with their other respective groups—The Black Seeds, TrinityRoots, Bongmaster, and others—for much of their 13-year career. Fat Freddy's Drop are known for their improvised live performances; songs on their studio albums are versions refined over years of playing them live in New Zealand, and on tour abroad. In music, a glissando is a glide from one pitch to another. It is an Italianized musical term derived from the French glisser, "to glide". In some contexts, it is distinguished from the continuous portamento. Some colloquial equivalents are slide, sweep, bend, smear, rip, lip, plop, or falling hail. A musical ensemble, also known as a music group or musical group, is a group of people who perform instrumental or vocal music, with the ensemble typically known by a distinct name. Some music ensembles consist solely of instruments, such as the jazz quartet or the orchestra. Some music ensembles consist solely of singers, such as choirs and doo wop groups. In both popular music and classical music, there are ensembles in which both instrumentalists and singers perform, such as the rock band or the Baroque chamber group for basso continuo and one or more singers. In classical music, trios or quartets either blend the sounds of musical instrument families or group together instruments from the same instrument family, such as string ensembles or wind ensembles. Some ensembles blend the sounds of a variety of instrument families, such as the orchestra, which uses a string section, brass instruments, woodwinds and percussion instruments, or the concert band, which uses brass, woodwinds and percussion. Woodwind instruments are a family of musical instruments within the more general category of wind instruments. There are two main types of woodwind instruments: flutes and reed instruments. What differentiates these instruments from other wind instruments is the way in which they produce their sound. All woodwinds produce sound by splitting an exhaled air stream on a sharp edge, such as a reed or a fipple. A woodwind may be made of any material, not just wood. Common examples include brass, silver, cane, as well as other metals such as gold and platinum. Occasionally woodwinds are made out of earthen materials, especially ocarinas. Common examples include flute, oboe, clarinet, bassoon, and saxophone. A jazz band is a musical ensemble that plays jazz music. Jazz bands vary in the quantity of its members and the style of jazz that they play but it is common to find a jazz band made up of a rhythm section and a horn section. Throughout history, various methods of musical instrument classification have been used. The most commonly used system divides instruments into string instruments, woodwind instruments, brass instruments and percussion instruments; however, other schemes have been devised. An aerophone is any musical instrument that produces sound primarily by causing a body of air to vibrate, without the use of strings or membranes, and without the vibration of the instrument itself adding considerably to the sound. Aerophones categorically comprise "the largest and most complex group of instruments in the Americas". A concert band, also called wind ensemble, symphonic band, wind symphony, wind orchestra, wind band, symphonic winds, symphony band, or symphonic wind ensemble, is a performing ensemble consisting of members of the woodwind, brass, and percussion families of instruments, and occasionally including the double bass or bass guitar. On rare occasions, additional non-traditional instruments may be added to such ensembles such as piano, harp, synthesizer, or electric guitar. The baritone saxophone or "bari sax" is one of the larger members of the saxophone family, only being smaller than the bass, contrabass and subcontrabass saxophones. It is the lowest-pitched saxophone in common use. The baritone saxophone uses a mouthpiece, reed, and ligature in order to produce sound. It is larger than the tenor, alto and soprano saxophones, which are the other commonly found members of the family. The baritone saxophone is commonly used in classical music such as concert band, chamber music, military bands, jazz. It also is occasionally employed in marching bands, though less frequently than other saxophones due to its size and weight. A multi-instrumentalist is a musician who plays two or more musical instruments at a professional level of proficiency. A pit orchestra is a type of orchestra that accompanies performers in musicals, operas, ballets, and other shows involving music. The terms was also used for orchestras accompanying silent movies when more than a piano was used. In performances of operas and ballets, the pit orchestra is typically similar in size to a symphony orchestra, though it may contain smaller string and brass sections, depending upon the piece. Such orchestras may vary in size from approximately 30 musicians to as many as 90–100 musicians. However, because of financial, space, and volume concerns, the musical theatre pit orchestra in the 2000s is considerably smaller. A multiphonic is an extended technique on a monophonic musical instrument in which several notes are produced at once. This includes wind, reed, and brass instruments, as well as the human voice. Multiphonic-like sounds on string instruments, both bowed and hammered, have also been called multiphonics, for lack of better terminology and scarcity of research. In music, a decet—sometimes dectet, decimette, or even tentet —is a composition which requires ten musicians for a performance, or a musical group that consists of ten people. The corresponding German word is Dezett, the French is dixtuor. Unlike some other musical ensembles such as the string quartet, there is no established or standard set of instruments in a decet. A wind instrument is a musical instrument that contains some type of resonator, in which a column of air is set into vibration by the player blowing into a mouthpiece set at or near the end of the resonator. 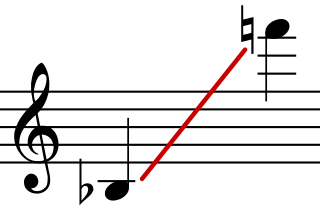 The pitch of the vibration is determined by the length of the tube and by manual modifications of the effective length of the vibrating column of air. In the case of some wind instruments, sound is produced by blowing through a reed; others require buzzing into a metal mouthpiece. A woodwind doubler is a musician who can play two or more instruments from the five woodwind families or other folk or ethnic woodwind instruments, and can play more than one instrument during a performance. A player who plays two instruments from the same family is also often considered a woodwind doubler, but is usually paid less than a player who plays instruments from different families. The woodwind section, which consists of woodwind instruments, is one of the main sections of an orchestra or concert band. Woodwind sections contain instruments given Hornbostel-Sachs classifications of 421 and 422, but exclude 423. Military and processional music was designed to fulfil necessary functions in a military environment, and accompanies pageants, parades, ceremonies, processions. A wind quartet is an ensemble consisting of a mixture of brass and woodwind instruments, or music written for a combination of four such instruments. It is distinct therefore from the woodwind quartet, brass quartet, and quartets made up of a single instrument type, such as the saxophone quartet. Anon. 2002. "Reed section". Grove Dictionary of Musical Instruments, Oxford Music Online (20 January; accessed 19 July 2018). Anon. 2013. "Horn (ii)". Grove Dictionary of Musical Instruments, Oxford Music Online (11 February; accessed 21 April 2016).